Posted by grhomeboy in Architecture Greece, Movies Life Greek. Given its multipurpose usage, the new Greek Film Library aims to attract a series of activities, ranging from education to entertainment. The building is situated on the junction of Iera Odos and Megalou Alexandrou roads in Athens. 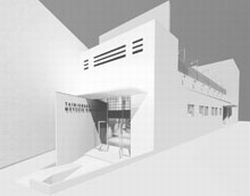 The new home of the Greek Film Library will be inaugurated in autumn 2008, on the premises of a former open-air cinema. Works at the former Lais cinema, are expected to start right away, signaling a decisive step toward modernization for the outdated structure-wise Film Library. The project is part of the Third Community Support Framework and is jointly funded by the European Union and the Ministry of Culture. Once construction work is over, the library will be in possession of 1,785 square meters of halls, spread over two levels, as well as a 700-square-meter loft which will operate as an open-air cinema. The Film Library will comprise a large screening hall with a capacity of 200 people, a smaller “Cine Club” screening hall for members with 60 seats, a 250-seat open-air cinema, a film museum, a library, an audiovisual reading room, audiovisual archives and offices. There will also be a bar, two foyers and a small shop. The architectural study was carried out by architects Nikos Belavilas and Vasso Trova. The listed building combines a simplified industrial architecture on the ground floor with more eclectic popular elements on the upper, open-air cinema. An effort was made to respect the building’s history, but also the identity of the neighborhood. The Lais cinema used to operate in the loft, with its own independent entrance on Megalou Alexandrou street. Some of the cinema’s structural features, as well as some of its old decorations, will be maintained. The screen, the bar, the stairwell, the screening room, the metal decorations and the lights will be kept and restored, as will also be the case with the building facades. The surfaces, the entrance and the modernist openings will be restored to their original condition. The Lais started operating in 1948 and closed down in 1975. According to pre-1976 newspapers, it used to run a weekly program with three films and daily screenings. It would occasionally host honorary soirees for actors and musicians, while at some point it also hosted local beauty pageants. For the building’s interior, emphasis was put on equipment, so that the Film Library will not lack the latest in modern technology. The building itself has been designed to provide the possibility of screening any kind of films, videos or digital images, in the halls, the reading room and in the library. The Film Library’s relocation from the Deligiorgi Mansion on Kanari Street in Kolonaki, central Athens to Metaxourgeio is a wise move. The latest cultural developments in Athens have focused on Metaxourgeio, a hub for emerging artists and new theaters. Metaxourgeio area is also close to the Gazi and Psyrri up-coming and major entertainment areas in Athens. The wider region offers a variety of advantages: It appeals to young people, it is developing a powerful cultural identity, with the Benaki Museum’s Pireos Street annex, the Technopolis Arts Complex and the Bios Arts Complex all nearby, and has also been attracting new residents over the past few years. As of next April it will also boast a new metro station, after the extension of the metro’s blue line toward Aegaleo. On the other hand, the derelict Deligiorgi Mansion is in no way suitable to house a contemporary European Film Library. As soon as works start, the administration will be temporarily moved to Solonos Street. In view of the new era on which the Film Library is about to embark, the institution’s staff is getting reorganized. Soon, director Theodoros Adamopoulos is expected to announce the members of a committee that will prepare the Film Library’s organizational details.